I stumbled upon PropTech a month ago, on 9/12, and was intrigued, both by the real estate use cases and also by specific Blockchain category. Recently, I was one of the 5 winners for IBM / Global Citizen’s #ChallengeAccepted Blockchain hackathon and I saw this as an opportunity to continue to hone my dev skills. From an investor point of view, I’ve always been a stocks and options guy, but Real Estate is something I have been looking at from afar. What I wanted to see in the marketplace was more options for investing beyond becoming a landlord or buying some REITs. I believe that Real Estate and Rentals are prime for fractal investing. I know Blockchain is the technology which can strengthen the ability to provide fractal investing across the Real Estate and Rental marketplace. In addition, I wanted to add a layer of community and localization, hence a focus on hyper-local as well. My thought is that investing in a property in your local community has an extrinsic value in that you can see it grow. These things came together to form the concept presented here called Charoo. 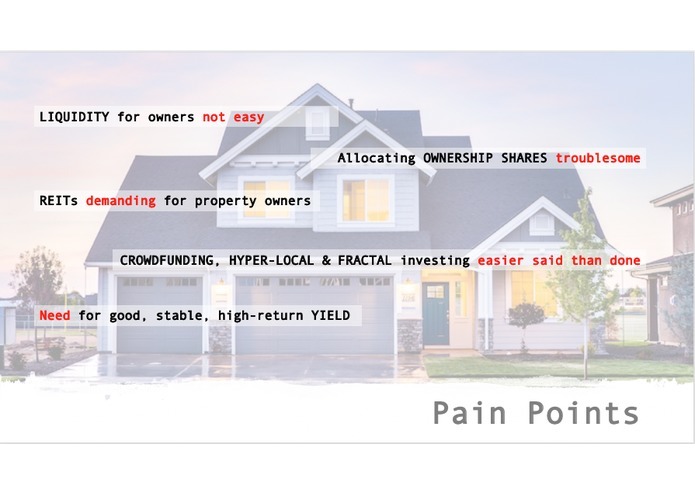 The simple pitch is “Fractal Ownership of Real Estate Property on Blockchain”. The bigger pitch is that Charoo provides each participant (Owner, Investor, Tenant) in the Real Estate Investing and Rental ecosystem a simple, secure and transperant platform to conduct business transactions such as investing, rental payments, disbursements and beyond. Owners can create a property on the platform and create “Funding Slots”, which are owner-defined amounts. For example an owner with a $250,000 property could open up 20 $5,000 slots, creating up to $100,000 liquidity while providing investors with, for example, a 7% Cap Rate. Typical apps have a Frontend, Middleware (REST API) and Backend. 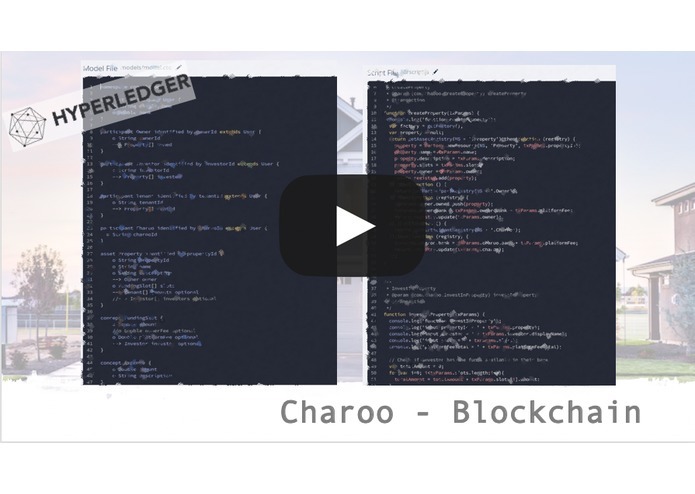 For Charoo, the backend prototype was Hyperledger. Hyperledger provides one-click ability to spin up RESTful services. Then the mobile frontend consumes the services to provide end user functionality. Given the compressed timeline, the focus on this entry was to design a frontend using Adobe XD, make it a prototype to show the flow. And then combine that with the Blockchain backend, which is fully working. As laid out below in What’s Next, if feasibility exists for Charoo, ramping to MVP is more than possible in a short time frame. Given the one month deadline to go from idea to presentable mockup given only limited nights and weekends, the decision I made was to focus on clickable mobile app mockup and a working Blockchain smart contract, both attached to this submission and also showcased in video. The larger challenge was further understanding of the Rental market. What exactly Property Owners and Investors look for in Real Estate investing. I read up on Cap Rates, 1% rule and other metrics to gain a limited insight in what matters. For both challenges there are plans to solve them while moving forward with Charoo. Two things, first going from a Penultimate sketch a month ago to the concept being in a presentable mockup a month later was a good feeling. Also, in the process, I learned Adobe XD and further refined my experience with Hyperledger. 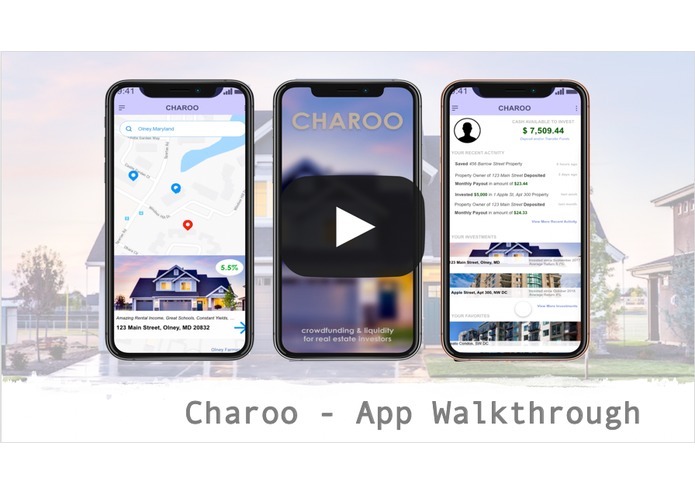 Second, taking something as broad as “Enable the sale of ownership shares for individual properties, enhance crowdfunding and improve investor liquidity” from hackathon industry requirements and building out Charoo was exciting, especially once video demo came together. Learned a lot about the inner workings of Real Estate and Rental Property Investing. Read up on challenges faced by small property owners and need for liquidity. Learned how to take those pain points and craft a concept such as Charoo. Discuss concept with subject matter experts in Real Estate and Property Owners to determine feasibility. If viable, focus on ramping up to a MVP within a few months for initial set of pilot users. Build up advisor board of Real Estate experts. Get together with UI/UX designer to strengthen overall experience and interface. Team up with native iOS developer to code FE while engaging with a cloud provider such as AWS, Azure or IBM to get the chaincode (Blockchain) and REST services in the cloud. 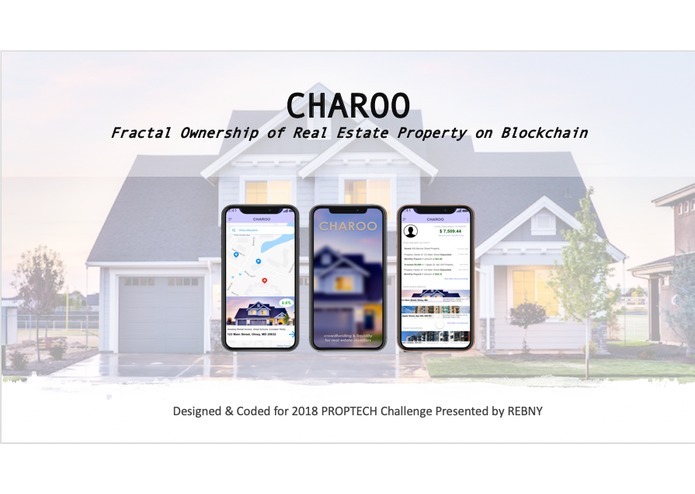 I’m excited to present the idea of Charoo to REBNY and gather feedback from Real Estate experts.